We’d love your help. Let us know what’s wrong with this preview of All But My Life by Gerda Weissmann Klein. All But My Life is the unforgettable story of Gerda Weissmann Klein's six-year ordeal as a victim of Nazi cruelty. From her comfortable home in Bielitz (present-day Bielsko) in Poland to her miraculous survival and her liberation by American troops—including the man who was to become her husband—in Volary, Czechoslovakia, in 1945, Gerda takes the reader on a terrifying jou All But My Life is the unforgettable story of Gerda Weissmann Klein's six-year ordeal as a victim of Nazi cruelty. From her comfortable home in Bielitz (present-day Bielsko) in Poland to her miraculous survival and her liberation by American troops—including the man who was to become her husband—in Volary, Czechoslovakia, in 1945, Gerda takes the reader on a terrifying journey. Gerda's serene and idyllic childhood is shattered when Nazis march into Poland on September 3, 1939. Although the Weissmanns were permitted to live for a while in the basement of their home, they were eventually separated and sent to German labor camps. Over the next few years Gerda experienced the slow, inexorable stripping away of "all but her life." By the end of the war she had lost her parents, brother, home, possessions, and community; even the dear friends she made in the labor camps, with whom she had shared so many hardships, were dead. To ask other readers questions about All But My Life, please sign up. "I had created a happy world of make-believe around me during the long years of loneliness, a world of beauty and love. It had helped me to survive, this lovely world that was to be mine when the war was over." what page is this quote on? Peachy It's towards the end, Part 3, second page approximately of chapter 4.
what happened to Gerta's father? Becki The assumption is that he died in one of the camps or transports. I should probably start out by saying that I'm not totally obsessed with WWII, Holocaust, concentration camps, terror, misery and death (here it comes...) BUT, I think I enjoy these stories because in each one, there is a story of HOPE, perseverance, and a remarkable accounts of humanity and triumph. It gives me a renewed sense of well-being, humanity, tolerance, strength and hope. No matter how bad my life seems to be, I can more easily remember that I really and truly have it SO very good. "All I should probably start out by saying that I'm not totally obsessed with WWII, Holocaust, concentration camps, terror, misery and death (here it comes...) BUT, I think I enjoy these stories because in each one, there is a story of HOPE, perseverance, and a remarkable accounts of humanity and triumph. It gives me a renewed sense of well-being, humanity, tolerance, strength and hope. No matter how bad my life seems to be, I can more easily remember that I really and truly have it SO very good. "All But My Life" is a beautifully written memoir of Gerda Weissmann's experiences through this horrific time. I am humbled by this woman's optimism, courage and determination. I am truly amazed that Gerda is a survivor. At the time of The Liberation, she weighed 68 pounds - and she was 21 years old! (That's about how much my Kati weighs right now, and she's 9!!!) Gerda had typhus and pneumonia shortly after that, and had sustained severe nerve damage to her feet. She recovered from all of the above, and has 3 children, and grand children. The artistry and vitality and heart with which Gerda Weissmann Klein brings to life her experiences as a young Polish Jewish girl during the Holocaust is nothing short of extraordinary. This is as moving and heartbreaking and life affirming as any book I’ve ever read. And perhaps its greatest triumph is that it brings back to life and celebrates the humanity of every individual who was close to Gerda, especially her mother and father, her older brother and her closest companion in the camps, a g The artistry and vitality and heart with which Gerda Weissmann Klein brings to life her experiences as a young Polish Jewish girl during the Holocaust is nothing short of extraordinary. This is as moving and heartbreaking and life affirming as any book I’ve ever read. And perhaps its greatest triumph is that it brings back to life and celebrates the humanity of every individual who was close to Gerda, especially her mother and father, her older brother and her closest companion in the camps, a girl called Ilse. For all its heartbreak All But My Life is a beautiful resounding testament to the preciousness of life. It’s perhaps odd to speak of the artistry of a book about the Holocaust but even the most gripping and moving story has to be told well to get itself across in all its power and significance. In this regard Gerda excels. She writes so well and she organises her material with such deft architectural skill. Gerda’s account of her family life before the horror begins is so focused, so economically alive with poignant detail that we feel a deep abiding affection for these people. Our heart goes out to them and stays with them. When her older brother comes to her room the night before he’s to be sent to a work camp I felt like I was in the room with her and Arthur was my own big brother. And this is the marvel of this book, she puts you there, she makes you experience what she’s going through on your own skin. I don’t think anyone has made me feel so acutely, so intimately the incomprehensible horror of what the Nazis did to the Jews. Nor can I recall any book that has made me cry as much as this did – my little boy was beginning to get a bit concerned and eventually I had to read it while he was asleep. But it’s far from being a depressing book. Just the opposite. In mood it’s like standing alone by the gravestone of a loved one – there’s pain and heartbreak but there’s also that sweep of wonder and cleansing sadness at the realisation of how much beauty an individual life imparts. This is a book about the Holocaust but it’s also about the marvels of kinship and family love and memory. This is a memoir but because of the narrative skill of the author it reads like the most gripping of novels. As Julie, who recommended this book to me, so presciently says in her review, "Here's what sets Gerda's story apart: first, she's an excellent story-teller and writer, so her tale flows like fiction, though, unfortunately, it is not."
. Beautifully told.... a very poignant and remarkable story of survival and courage. This is the story of Garda Weissmann Klein's six year ordeal as a victim of Nazi cruelty, from her confortable home in Bielitz in Poland to her miraculous survival and her liberation by American troops including the man who was later to to become her husband . I never find it difficult to explain why I read so many books written by Hollocualt survivors as I find their stories compelling, remarkable, and inspiring . Beautifully told.... a very poignant and remarkable story of survival and courage. This is the story of Garda Weissmann Klein's six year ordeal as a victim of Nazi cruelty, from her confortable home in Bielitz in Poland to her miraculous survival and her liberation by American troops including the man who was later to to become her husband . I never find it difficult to explain why I read so many books written by Hollocualt survivors as I find their stories compelling, remarkable, and inspiring and with each book I read I am grateful and indebted to these remarkable people for having the courage to share their memories with the public so we can can never forget the past and the terror and pain endured by these survivors and their families. I listened to this account on audio and while I can highly recommend the book I cant recommend the audible as the quality was poor and quite muffled, I had to adjust the volume on numerous occasions. It almost felt like I was listening to an old black and while movie with poor sound and the narrator sounded bored reading the book. However I cannot fault the memoir as it is moving and insightful, Greda's story is heartbreaking and yet uplifting, this is a book that will stray with me for a long time.I particularly loved the the epilogue and how her American life turned out. I can't possibly award any stars to this novel. There are not enough to even come close to the tragedy, the horror, and the depraved behavior that Gerta Weissmann suffered at the hand of the Nazis. She lost everything, family, friends, and came close to losing her life on many occasions. Starting at the age of eighteen, Gerda who had led a life filled with family love, would often think of her family and those thoughts seemed to keep her going with the hope that one day she would reunite with he I can't possibly award any stars to this novel. There are not enough to even come close to the tragedy, the horror, and the depraved behavior that Gerta Weissmann suffered at the hand of the Nazis. She lost everything, family, friends, and came close to losing her life on many occasions. Starting at the age of eighteen, Gerda who had led a life filled with family love, would often think of her family and those thoughts seemed to keep her going with the hope that one day she would reunite with her parents and her beloved brother. During the winter of 1945, she began a march from a labor camp in Germany to Czechoslovakia. She was joined, beset by the cold , inadequate clothing and food, and rampant illness, by four thousand other women prisoners. Gerda was one of the few, one of only one hundred twenty to survive. When asked how she did it, she oftentimes could not explain. As was the case with all survivors of the Nazi atrocities, she could not understand why she was spared. Everything she loved, everything she knew was obliterated. I don't permit myself many Holocaust memoirs. I just can't stomach how dark the human heart can be. But, we've got a new leader taking office here in the U.S. come this January, and he says he doesn't like Saturday Night Live, and he doesn't like Vanity Fair magazine and he doesn't trust the New York Times. . .
And, I'm okay with any of our leaders EXPRESSING their likes and dislikes, just as I'm okay with any citizens doing the same, but when a leader threatens to shut down programs or magazine I don't permit myself many Holocaust memoirs. I just can't stomach how dark the human heart can be. But, we've got a new leader taking office here in the U.S. come this January, and he says he doesn't like Saturday Night Live, and he doesn't like Vanity Fair magazine and he doesn't trust the New York Times. . .
And, I'm okay with any of our leaders EXPRESSING their likes and dislikes, just as I'm okay with any citizens doing the same, but when a leader threatens to shut down programs or magazines or newspapers, well, then, we ALL must start PAYING ATTENTION. And, when a person feels shaky about new leadership or an unusual direction being taken within their community, I don't think it's a bad idea to read a Holocaust memoir. Lest we forget. I've read only three memoirs from the Holocaust: Anne Frank's, Wladyslaw Szpilman's, and now Gerda Weissman Klein's. They are all similar, different, excellent, and horrifying. Here's what sets Gerda's story apart: first, she's an excellent story-teller and writer, so her tale flows like fiction, though, unfortunately, it is not. Second, her family was affluent and influential, and it's important to be reminded that, ultimately, the "ethnic cleansing" spared no one. Third, Gerda is feisty and flawed. This is not the story of a "sacrificed angel." This is a magnificent, messy woman whose life is relatable, human, and interesting. When this particular story ended, I found myself hungry to know more, more, and more about Gerda. And I will! Papa entered the last car and went to the open platform at the rear to see us as long as possible. There he stood in his good gray suit, his only one, his shoulders sloping, his hair steel gray in the sun, on his breast the yellow star and black word. There he stood, already beyond my reach, my father, the center of my life, just labeled JEW. When I got into the shower and felt the warm water on my skin, I started to shiver. My teeth chattered. I leaned against the tiled wall of the cubicle and vomited while the water ran over me. When my stomach was empty, I carefully washed the floor. I prayed that I should never be assaulted, for I knew I would strike back, even though I would have to pay for it with life itself. I have almost total recall of certain moments from my early years, at home and in the camps, but that, too, can be a sword--albeit double-edged--with which to slay contemporary dragons. Such a duel is all the fiercer if the adversaries share the same body. This was a favorite book from middle school. My mom wouldn't let me read Night yet (which of course I immediately stole off the bookshelf and devoured) so I started with this. Being a young girl myself, I think the story affected me in a way that it could not have if I had read at an older age. The copy I read was my mother's from when she was a girl. I lost this wonderful book (I could barely keep track of my own head in middle school) and cried bitterly. I still feel horrible about it. It woul This was a favorite book from middle school. My mom wouldn't let me read Night yet (which of course I immediately stole off the bookshelf and devoured) so I started with this. Being a young girl myself, I think the story affected me in a way that it could not have if I had read at an older age. The copy I read was my mother's from when she was a girl. I lost this wonderful book (I could barely keep track of my own head in middle school) and cried bitterly. I still feel horrible about it. It would have been really special to share that copy with my daughter someday. Assuming she would be a bookworm like me. I'll be scandalized if not! I had the good fortune to hear this woman speak at a bat mitzvah I attended in Indianapolis about 15 years ago. It was a wonderful surprise. She was a very old woman, and small. She spoke with a kind voice and I remember being so shocked to be in the presence of someone who had seen such horrible things. It made me (as much as possible at the tender age of 15) really aware of the close proximity of the surface of my happy suburban midwest American bubble. I have no idea what it is like to suffer. Gerda Weissmann Klein writes of her holocaust experiences. Born on May 8, 1924, she was fifteen when on September 1, 1939, the Nazis invaded Poland. Her family was Jewish, well-off and lived in Bielitz, Poland. We follow her straightforward, step by step account of the next six years—her path from labor camp to labor camp and then the horrendous death march over the Czech border to be finally rescued by American soldiers, one of which came to be her husband. Both her fate and those of her closes Gerda Weissmann Klein writes of her holocaust experiences. Born on May 8, 1924, she was fifteen when on September 1, 1939, the Nazis invaded Poland. Her family was Jewish, well-off and lived in Bielitz, Poland. We follow her straightforward, step by step account of the next six years—her path from labor camp to labor camp and then the horrendous death march over the Czech border to be finally rescued by American soldiers, one of which came to be her husband. Both her fate and those of her closest companions are clearly and succinctly spoken of. The account is riveting, all the more so due to the straightforward, dispassionate tone in which it is told. Her recuperation, marriage to Kurt Klein in 1946 and finally, in the epilog, her engagement after the war in Jewish community work and holocaust awareness programs is briefly spoken of. It is the lack of melodrama and the clear and concise telling that gives the book its strength. Gerda Weissmann Klein speaks of her emotions but does not exalt in them. She is not looking for pity. She analyzes what kept her going, why she did not give up and what the experience has taught her—the value of bringing happiness to others. On closing the book, one is left with great admiration for this woman. The audiobook is read by Grace Conlin. I have given the narration four stars, just as I have the book. She reads the book slowly; giving the events the gravity they merit. Some of the places and names are muffled, which I believe is a result of faulty recording. Perhaps it is a sense of morbidity that leads me to read the most heartbreaking memoirs. Perhaps it is an innocent interest in history. I think, though, that it is because I experience my life - my comfortable, easy life - so much more richly when I see how others have suffered and survived. All But My Life is Gerda Weissmann's story of her experiences as a Jew during the Holocaust. It is unlike all of the other Holocaust memoirs I have read, perhaps because it is the first in which a female sur Perhaps it is a sense of morbidity that leads me to read the most heartbreaking memoirs. Perhaps it is an innocent interest in history. I think, though, that it is because I experience my life - my comfortable, easy life - so much more richly when I see how others have suffered and survived. All But My Life is Gerda Weissmann's story of her experiences as a Jew during the Holocaust. It is unlike all of the other Holocaust memoirs I have read, perhaps because it is the first in which a female survivor tells her story. Again and again I was struck with Gerda's strength and hope (something often pointed out by the people around her, even if she does not always recognize it in herself), so much so that I could understand why she never really succumbed to the belief that she would perish as so many others had. And yet, as with so many other stories of Holocaust survival, I couldn't get past just how much all of those who lived relied on luck - some chance happening or favorable aligning of the stars that meant living just one more day. This is a difficult thing for me to understand. So many times we are tuaght that the strong survive, the weak perish. It is only natural for us to think that the people who survived the Holocaust were the strongest, the fittest, the most intelligent. But this is not true. Those people died just as often as did the meek and delicate. It is terrifying to put yourself in the same position as the Jews who faced this horror, because you cannot with any surety say that you would survive, no matter how strong or clever you were. In this fascinating volume Gerda Weissmann talks about her experiences during the holocaust from the age of 15 to 20. She tells of three years in a labour camp , and three years of a forced winter march from Poland to Czechoslovakia. What makes this book remarkable is the decency and love that sustained her through these horrific times , and her incredible strength of character. Through her memory , she uses vast decriptive powers to redraw the picture of what life was like in those harrowing years In this fascinating volume Gerda Weissmann talks about her experiences during the holocaust from the age of 15 to 20. Through her memory , she uses vast decriptive powers to redraw the picture of what life was like in those harrowing years. It was her father's insistence on a warm June day that she take her winter sky boots with her that saved her during the forced winter march a few years later-many of the girls there died for lack of footwear. She describes them as 'little matchstick girls' , drawing on the old fairy tale about the little girl that died in the cold. She tells of her camps siters Illse , Liesl and Suse none of whom survived-the last dying only moments after being liberated by American forces. The author held on to life through memories of her family and the vow she made to her father to never give up on her life. The author ends the memoir with a summary of her life in America after the war , writing this epilogue 37 years after the first edition of all But My Life was published. She tells of her children and her grandchildren , her love of America and of Israel, and of her meeting with Menachem Begin , who had read her memoirs and showed his characteristic depth of love and humanity. She tells of the welfare of all children are of utmost importance to her ,the abused , the handicapped , the underprivileged , the ill.
Ilse, a childhood friend of mine, once found a raspberry in the concentration camp and carried it in her pocket all day to present to me that night on a leaf. Imagine a world in which your entire possession is one raspberry and you give it to your friend." Gerda Weissman grew up in Poland. She has a loving, close family. We see the disintegration of normal life as her family is torn apart. Gerda is deported and sent to various work camps and concentration camps. In the midst of Nazi cruelty and b Ilse, a childhood friend of mine, once found a raspberry in the concentration camp and carried it in her pocket all day to present to me that night on a leaf. Imagine a world in which your entire possession is one raspberry and you give it to your friend." Gerda is deported and sent to various work camps and concentration camps. In the midst of Nazi cruelty and brutal working conditions she forms close friendships. The fact that she is one of the lucky ones is staggering. These chance moments where she is picked to work instead of die seem incredible, but you realize that without incredible luck, a Polish Jew would die. I appreciated how this memoir started with German occupation rather than in the work/concentration camps. Somehow the in-town treatment of the Jews was almost more nausea-inducing to me than the more-commonly-repeated tales of the camps---not because the treatment was less humane in the towns but because the general public knew what was going on and let it happen; it wasn't just the military being cruel behind closed doors. The author keeps a rather calm tone throughout, which made it even more I appreciated how this memoir started with German occupation rather than in the work/concentration camps. Somehow the in-town treatment of the Jews was almost more nausea-inducing to me than the more-commonly-repeated tales of the camps---not because the treatment was less humane in the towns but because the general public knew what was going on and let it happen; it wasn't just the military being cruel behind closed doors. The author keeps a rather calm tone throughout, which made it even more chilling for me when coming across facts like (at the end of the war), "I was weighed---sixty-eight pounds." One thing I found most interesting about this story was that Gerda's teenage personality comes through really well. She doesn't sugar-coat the fact that she often snubbed her mother even up to their last hours together (though I was surprised she never mentions attempting to write her) nor the fact that Gerda was often fickle in her friendships. This book. It was amazing, heartbreaking, lyrical, shocking, and emotional. Gerda's personality is similar to mine, and so many things she said I felt and understood so well. This is one of those books that you just can't even grasp when you've finished. The ending was amazing, and Kurt...*sighs happily* Love this book so much, although it was painful and emotional for me to read. It opened my eyes to how much I complain, and that I take the little things in life (and freedom) so much for grante This book. It was amazing, heartbreaking, lyrical, shocking, and emotional. Gerda's personality is similar to mine, and so many things she said I felt and understood so well. This is one of those books that you just can't even grasp when you've finished. The ending was amazing, and Kurt...*sighs happily* Love this book so much, although it was painful and emotional for me to read. It opened my eyes to how much I complain, and that I take the little things in life (and freedom) so much for granted. "I wanted to reach out to young people, make them aware of the preciousness of life, and show them that it was not to be thrown away thoughtlessly, even under conditions of extreme hardship. I always wanted to impress upon them how wrong it is to seek a permanent solution to a temporary problem." After reading the whole book, I just sat there like, "Wow, that is just amazing." Through it all, she saw the sanctity of life. I never felt her bitterness in her account, and that was even sweeter to me. So yes, this book is a new favorite. This book has nearly 11,000 ratings and nearly 800 reviews and the rating averages 4.3 out of 5. Need I say more? Gerda Weissmann Klein should be read by anyone interested in what the holocaust did to the Jews, especially the young that were able to live through death camps and the death march AND to be able to write about it. Today Gerda is still alive at 92. I will loan this book out to friends, but it will have a permanent spot on my bookshelf. 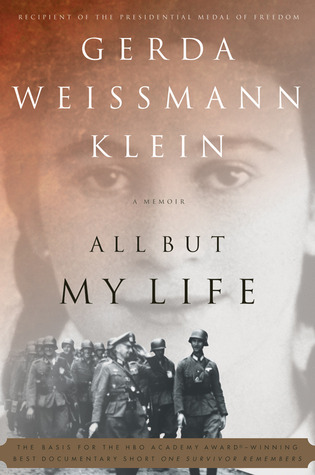 All But My Life by Gerda Weissman Klein is a memior written about the authors's experiences during World War II. Gerda Weissman Klein was a Polish Jew along with her family who encountered many hardship from the German Nazis. When they first invaded, the Jews got threatened by German Nazi who invaded Poland on Spetember 1, 1939. It took the Germans only 8 days to conquer Poland. When they invaded they tooks Jews gold, autmobiles, bicycles, and radios. When they invaded the Jews were forced out o All But My Life by Gerda Weissman Klein is a memior written about the authors's experiences during World War II. Gerda Weissman Klein was a Polish Jew along with her family who encountered many hardship from the German Nazis. When they first invaded, the Jews got threatened by German Nazi who invaded Poland on Spetember 1, 1939. It took the Germans only 8 days to conquer Poland. When they invaded they tooks Jews gold, autmobiles, bicycles, and radios. When they invaded the Jews were forced out of their himes and temple were burned down. Many people along with the Weissman fmaily was forced to rebuild parts of Poland that was destoryed form the attack. Her family was then forced to move into the basement of their own house. They and along with many other people were stamped JEW on their ration cards to recieve less food. ?In addition to beign disrciminated, they had to wear a yellow start to represent that they were a Jews and got punished if they didn't. Gerda as one of the victim was sent out of her own country. Even though so many hardship was forced on the Jews, Gerda stated "to you, life still means beauty, and that is how it should be" (115). Even though many people got killed, there is no excuse to just give up on up beucase life is suspose to be worth cherishing. Gerda's parents were taken to death camps and killed from there along of 3 million other people. Thus, it was hard to make friends beucase many would have to mourn the death of the people they loved for example Suse and Lisel who were friend she made at the camp and died went sent on the death march. Even though it was sad and depressing to see people die there was still always have to be hope in her survival. She said after many of her loved one passed away ""now i have to live," i said to myself, "beucase I am alone and nothing hurt me any more""(206). This shows that in order to not lose hope is to suffer so much and get back up to become a stronger and powerful person. "Why? Why did we walk like meek sheep to the slaughter-house? Why did we not fight back? What had we to lose? Nothing but our lives. Why did we not run away and hide? We might have had a chance to survive. Why did we walk deliberately and obediently into their clutches? I know why. Because we had faith in humanity. Because we did not really think that human beings were capable of committing such crimes." "Throughout my years in the camps, and against nearly insuperable odds, I knew of no one who committed suicide. I wanted to reach out to young people, make them aware of the preciousness of life, and show them that it was not to be thrown away thoughtlessly, even under conditions of extreme hardship. I always wanted to impress upon them how wrong it is to seek a permanent solution to a temporary problem." I was sitting at the reception table greeting guests for an event hosted by Chapman University. Gerda Weissmann Klein was the special guest. She came up to the table with a professor I know and although I didn't know who she was, never having met her before, I stood up to greet her and take her hand. There is a presence to her that reached out and touched my soul. Looking into her eyes, I saw a peace and strength that took my breath away. She recognized my reaction and she smiled. She told her s I was sitting at the reception table greeting guests for an event hosted by Chapman University. Gerda Weissmann Klein was the special guest. She came up to the table with a professor I know and although I didn't know who she was, never having met her before, I stood up to greet her and take her hand. There is a presence to her that reached out and touched my soul. Looking into her eyes, I saw a peace and strength that took my breath away. She recognized my reaction and she smiled. She told her story, this story, at the dinner and it brought most of us to tears. Reading her book adds another dimension to what we heard that night. When she spoke I was witness to what she became. I saw a Holocaust survivor. In the book, you see the young girl, the teenager dealing with unspeakable horror, pain and loss. Her reactions, her feelings come through as she dealt with the catastrophic changes to her life. She used anger, faith and love to keep going. Not too long ago I read "Left to Tell" by Immaculee Ilibagiza. I had the privilege of meeting her as well. She has the same eyes. She gives the same smile. She suffered a similar horror in the Rwandan Holocaust almost 50 years later. "You are lucky mother. If only I could be certain that someday my children would be standing on my grave." I have read at least 10 Holocaust memoirs and although all of them tell very similar stories (idyllic pre-war life, initial occupation, hope and belief that the war will end soon, initial forced emigration, hardships of camp, summary executions, horrors of forced marches through snow, etc) I keep reading them because they are all special. The circumstances of each story may be similar, but e "You are lucky mother. If only I could be certain that someday my children would be standing on my grave." I have read at least 10 Holocaust memoirs and although all of them tell very similar stories (idyllic pre-war life, initial occupation, hope and belief that the war will end soon, initial forced emigration, hardships of camp, summary executions, horrors of forced marches through snow, etc) I keep reading them because they are all special. The circumstances of each story may be similar, but each individual author struggles against despair in his or her own way. Each approaches reintegration into normal life uniquely too. One of the things that made this book so special was the post-liberation narrative (including the wonderful epilogue written in 1994) about Gerda forging new relationships and developing her new life. I'm so glad that she didn't stop writing when she came to the end of the war. I can't say too much without spoiling, but I will say that I shed a few man-tears as her post-war drama unfolded. Such a touching story of a young woman during the holocaust. What amazed me the most was how she retained her humanity throughout her long years during WWII. And it had such a sweet romance at the end! Fabulous read. I actually think the best part was at the end and her descriptions of the liberation--I was on an airplane and I couldn't stop myself from crying. During a horrible march where everyone was starving: "Later, as the wagon rolled through the little Such a touching story of a young woman during the holocaust. What amazed me the most was how she retained her humanity throughout her long years during WWII. And it had such a sweet romance at the end! Fabulous read. I actually think the best part was at the end and her descriptions of the liberation--I was on an airplane and I couldn't stop myself from crying. During a horrible march where everyone was starving: "Later, as the wagon rolled through the little town, a window opened above us and a piece of bread fell right into my lap. I clutched it. A dozen hands stretched toward me, begging. For a minute I wavered. Then I divided the bread carefully among the girls." After the American soldiers liberated the girls: "Other soldiers carried girls in their arms like babies, speaking to them soothingly in words the girls did not understand. But the gestures of warmth and help were unmistakable." I have to start this review by saying, I saw Mrs. Klein's documentary “ One Survivor Remembers” several years ago. I watched it many times. The documentary was very good.... but the book was INCREDIBLE!!!!! It was the most moving and emotional book dealing with the Holocaust that I ever read.. I cried from beginning to end, because I knew the basics of her story. I strongly recommend this book for those interested in learning what actually went on during the Holocaust. Thank you to the author (an I have to start this review by saying, I saw Mrs. Klein's documentary “ One Survivor Remembers” several years ago. I watched it many times. The documentary was very good.... but the book was INCREDIBLE!!!! !